We absolutely love to eat Chinese food in this family. That’s why I was super excited when MyBlogSpark contacted me about doing a Wanchai Ferry frozen entrée review and giveaway! These meals are perfect to have on hand for those nights you´re in the mood for Asian cuisine, but would rather enjoy it with a relaxing night in. These meals are found in the freezer section of the grocery store and come complete with everything you need to make a restaurant quality meal in the comfort of your own home. The newest Wanchai Ferry flavor, Beef &Broccoli, is the first beef dish in their line of great-tasting, complete Chinese meals for two. Ready to serve in only 14 minutes, Wanchai Ferry Beef & Broccoli comes with tender beef strips, and an assortment of Asian-style vegetables, including broccoli florets, red peppers and water chestnuts. It even includes rice and a rich brown sauce accented with soy and garlic for an authentic flavor experience. Sounds delicious, right? Well if you’d like to try one of these frozen meals, be sure to print the Wanchi Ferry coupon here to save $1.50 on your purchase. 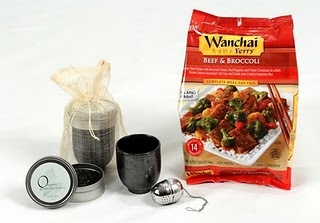 Even better, one lucky The Frugal Mom reader will win a Wanchai Ferry prize pack that includes a coupon for one frozen Beef & Broccoli entrée, as well as two tea sets. Fill out the form below to enter! The winner will be announced on June 11, 2010. Good luck! *Information, gift pack, and giveaway have all been provided by Wanchai Ferry through MyBlogSpark.